The first application of immersive, object-based audio for an Olympics broadcast took place on Aug. 5 during the event’s Opening Ceremony, from the Maracanã Stadium in Rio de Janeiro, using Dolby Labs’ Atmos format. Done in parallel in 4K HDR on the video side, the Opening Ceremony’s Atmos audio mix was done in a 5.1.4 configuration — a standard 5.1-surround discrete mix at the core plus four “height” channels — by NBC Sports A1 Jayson Polansky working with technical advisors from Dolby Labs, including Dolby Broadcast Support Director Mike Babbitt. 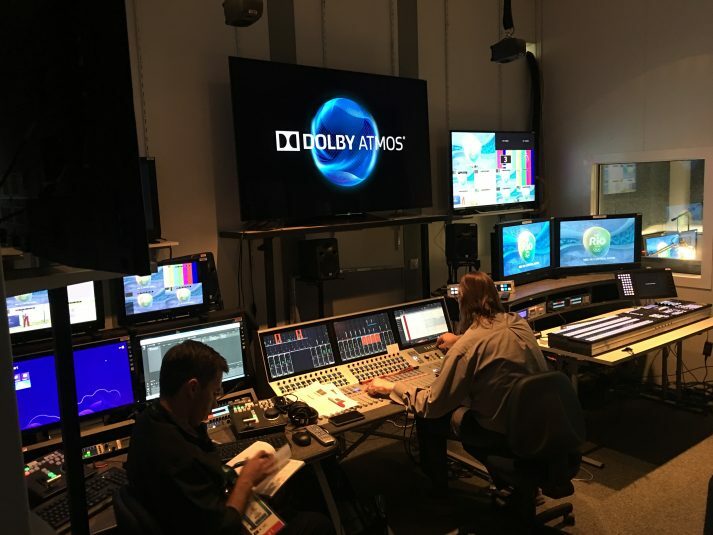 Feeds were sent from the Olympics Broadcast Services facility to the Dolby Atmos mix area in one part of the NBC Olympics control room in Rio. The Atmos-encoded mix was backhauled from Rio via a DolbyDigital Plus (aka DD+ and Enhanced AC-3) compressed bitstream to NBC facilities in New York City and to a reception at the Brazilian embassy in Washington, D.C.
A1 Jayson Polansky mixing the Rio 2016 Opening Ceremony audio using Dolby’s Atmos system. According to Jeffrey Riedmiller, VP, sound technology, Dolby Labs, the live Atmos mix was constrained to an extent by the limits of the existing broadcast 5.1-surround infrastructure at the Olympics. The DD+ format has been technologically extended to accommodate Atmos during the format’s coming rollout into the larger broadcast-audio environment. In total, the Atmos mix comprised 24 channels of audio: six standard surround channels plus 18 channels of ambient and crowd sound from six microphones on each of three levels of the stadium. Much of the height information was derived from these sources. The live Atmos mix was performed on a Calrec Summa console. Last May, Polansky, Babbitt, and Dolby Senior AV Mixer Jurgen Scharpf met to do a dress rehearsal of the Opening Ceremony’s Atmos mix at the Dolby offices in New York City, to learn how to most effectively use the Summa’s 5.1-surround panning controls and capabilities to allow the positioning of the Atmos audio objects in three dimensions rather than two. The axes were the conventional left-center-right array and the left and right rear channels, as well as four overhead channels, divided into two speakers each for front and rear height arrays. The Atmos mix was monitored through a combination of JBL 6325 speakers as the 5.1 array and four 8320A speakers suspended from the ceiling as the overhead array. With AC-4, the broadcast version of Atmos approved as the audio standard for the ATSC 3.0 format, demand for mixing live broadcasts in Atmos will increase. Dolby executives decline to discuss any plans for training or to comment on hardware adaptation by manufacturing partners at this time, other than to say the company will develop strategies that will be efficient for the ramp-up of Atmos for live television.